Spoke to mechanic re this mystery bumping I have been experiencing. Not good news. He has no idea what the problem is - suggested it might be a "...mixture of different things..." but wasn't prepared to be specific. Suggested the 'gearbox' but none of it fits in with the actual symptoms. It feels for the world like an uneven tyre or rim - but its definitely not! Did you ever get the fork oil changed? Might of missed the response but that was on mar 1st. If you did what, weight of oil and what amount did you use? Did you get right with the the air and suspension system? Try setting up your air system on the center stand using a hand pump vs side stand. You questioned steering head bearings one time. Are we good there? Just found this site www.gl1100goldwings.com All and only 1200s, more help for your situation,hope this helps. Did you start a new thread here? You need to put docs on instant mssg alert . Been waiting over two hours for a reply. Just takes a second to go brb. good, your motorcycle doing ok then? No. I was 'driving not 'riding' as I was on my way to collect my bike. To answer your questions.....no, I haven't changed to fork oil. The problem is at the rear of the bike. Man, a brain teaser for sure. After reviewing everything you've done so far the only 2 things I can think of that's left to check on your bike is the rear brake rotor for warping and the removable frame section for correct tightness located on the bottom left side of the frame under the engine. Maybe I missed it, or just forgot? ….. but has the rear wheel been off, was the bearing still a tight fit on the FD side of wheel? Yep, all bearings checked, they were the first thing looked at actually. I know right!! I am sat by my laptop now. A cold and misty English morning.....to satisfy myself I am going to put that new UJ in, change the Swingarm bearings, change seals in brake caliper. You know its funny that you mention the rear rotor. I think it is warped somewhat. There is a juddering when I use the reat brake and the rear wheel doesn't spin freely with it on. I'll pay extra attention to that today. Probably give the master Cylinder a good clean too. Thanks everyone for your feedback - we will solve this mystery soon eh? All it takes to "warp" a rotor some is a fall of a wheel onto a concrete floor when off for a tire change, doesn't have to be heat related. A wheel with tire still on it and rotor,just removed from bike, being rolled out of way, falls over on side. Ouch? Friend's 1200 had a seized rear caliper, you could hardly push the bike and to ride it took a lot of throttle, when rear brake got hot, it would "judder". You could wedge the caliper a little with a small prybar, it'd push easy until that rear brake was used and caliper would stick clamped on rotor. Seen brake hoses suffer internal defect and also stop fluid pressure release. Then, just crack a bleeder for a split second and if releases, hose is bad. The frame just under the left side of the engine is actually bolted into place and not part of the welded assembly. It is typically unbolted and removed when the engine is to be taken out of the bike. 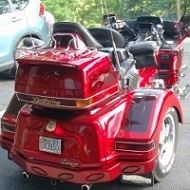 Without that feature of the frame it would be impossible to remove a Goldwing engine from the bike. Look on either end of that removable piece and you'll see 2 bolts with acorn nuts. If that section was loose it would allow a lot of frame flex as you tried riding your bike. Tire out of round , tire out of balance ,Tire delamination , water dirt or tools left in tire and warped brake rotor . All checked mate....the mystery remains. Yesterday I gave the rear caliper a good clean with new seals. The slider was seized so that's free now. Also took out the swingarm pivot bolts. Right one was fine regreased and put back (didn't realise you could see the UJ through there!!) The left one had some rust just after the thread and little grease so cleaned and greased up. Despite having a new bearing and seal kit I didn't take the swingarm off as limited time yesterday. Going to rebalance the carbs today and run a bit of Redex (UK version of Seafoam) through them. Check tyre pressures and take her out. Finding it easier to maintain with th lower fairing off and quite like the look of her without that too. Facing all that the only other options now are changing UJ (though not convinced that's the problem). Change swingarm bearings. Maybe cush rubbers but all seemed good in the FD when I last looked. Could I be looking at the wrong end of the Bike? I mean I would swear night is day the problem is at the rear though especially as the bumpiness (can't think of another word to describe it) is worse under load - even more so under 20mph in 1st or 2nd gear and riding up a slight incline. Feels like the rear is going over speed bumps!! Another thought - get a friend to ride with you on another bike and have him ride alongside, behind, everywhere around you to see if he can spot anything amiss. I know, when I ride in a group, someone will always spot something wrong with someone else's bike which you won't spot when it's standing still. I had a tire to start bumping one time , it was wore out. Hard to ride under 25 miles per hour, it showed no visible damage on the outside. Unfortunately these are less than a month old. Did you have these problems with bumping before the new tire was installed? Yeah, afraid so. Initially thought it was carbs but then noticed it was happening in neutral AND with the engine off.